Kabana values the fact that you shouldn’t have to worry about chemicals in personal care products you and your family use every day. We deliver by creating effective products, made with healthy organic ingredients, so you understand what you’re putting in your body and feel safe about it. 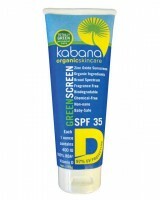 Kabana realizes skin is the gateway to the rest of your body. Our personal care products are designed to nourish not only your skin, but also be healthy for your body as a whole; your tissue, your organs, your nervous system, your reproductive tract, your children (even if you don’t have them yet). Most manufacturers have ignored this personal care concept for decades. We choose ingredients that are biochemically identical to the building blocks your body already uses. This approach eliminates concern about chemical exposure and bioaccumulation, and maintains your health throughout a long life.